Devadas (old) Devadas (Akkineni Nageshwara Rao)is a well educated guy who returns to his village after spending several years in London for his education. Parvathi (Savitri) is his childhood sweet heart and both of them make a very adorable pair. Things take a bad turn when Parvathi's family proposes for marriage to Devadas's family and get rejected on the grounds that they are of inferior caste and social status. Devadas upon persistence and threatening from his father rejects Parvathi when the latter meets him personally and asks for his love. A dejected Devadas returns to the city while Parvathi gets married. Devadas realizes that he is deeply in love with Parvathi but comes to know that she is already married when he returns to his village. To forget her he becomes alcoholic and spends his time with a courtesan named Chandramukhi (Lalita) who falls in love with him. As time pass by Devadas condition worsens due to heavy drinking and after knowing that he doesn't have much time left and plans to meet Parvathi for one last time. In a fitting climax he dies even before he meets Parvathi ending the movie on a sad note. .
A trendsetting movie in telugu film industry with top-notch acting from all the lead actors. All the songs of the movie are evergreen classics. 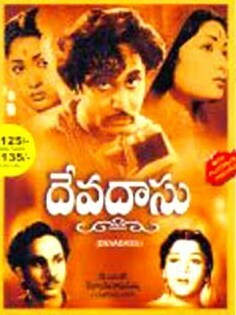 The movie which made the name 'devadasu' a household name for anyone who fails in love. A must watch for every telugu movie lover.